UPDATE: There is a question as to whether The New York Times properly represented the state of ebooks. I address that and other questions in this Daily Update, the pertinent part of which is available for free. As I’ve noted repeatedly, I believe the impact of computing and the Internet on the world will ultimately rival the Industrial Revolution in importance. And, by extension, I think said impact has only just begun. For the first several decades of the high tech industry most firms were occupied by competing with each other; it’s only in the last half decade or so that attention has increasingly turned to industries which have at most leveraged computing and the Internet to do what they did previously slightly more efficiently. For example, you’ve been able to book hotels online for a long time, which meant the Internet was basically a super efficient travel agency. Airbnb, on the other hand, is challenging the fundamental assumptions that underly the existence of hotels in the first place. You can say the same thing about Uber and transportation, Amazon and retail (and infrastructure), and Netflix and TV. It’s no accident that these companies were my primary examples in Aggregation Theory. I know theory talk bores some of you, but there is a purpose: if there do turn out to be common elements to events that are happening in multiple industries, then perhaps we can build a predictive framework that anticipates what industries will be affected next, and how (or, on the flipside, identify opportunities for new companies and a plan of attack). In that light, while it is satisfying when the theory is seemingly borne out, what is most interesting — and most useful — is disconfirming evidence: industries that seem to prove the theory wrong. Like, say, book publishing. Given this, what we should expect with ebooks is that because the Internet has made book distribution free, publishers should be at a significant disadvantage to an entity (i.e. Amazon) that, thanks to a superior user experience, owns consumer relationships at scale. And, over time, the previously integrated relationship between distributors (publishers) and suppliers (authors) should be broken apart as the latter sell directly through the aggregator (Amazon). However, that isn’t happening in practice. But the digital apocalypse never arrived, or at least not on schedule. While analysts once predicted that ebooks would overtake print by 2015, digital sales have instead slowed sharply. Now, there are signs that some ebook adopters are returning to print, or becoming hybrid readers, who juggle devices and paper. Ebook sales fell by 10 percent in the first five months of this year, according to the Association of American Publishers, which collects data from nearly 1,200 publishers. Digital books accounted last year for around 20 percent of the market, roughly the same as they did a few years ago. Ebooks’ declining popularity may signal that publishing, while not immune to technological upheaval, will weather the tidal wave of digital technology better than other forms of media, like music and television. First off, I’m not necessarily surprised that publishers haven’t all gone bankrupt en masse. Much like the music labels publishers have always provided more than distribution, including funding (using a venture capital-like process where one hit pays for a bunch of losers), promotion (discovery is the biggest challenge in a world of abundance, and breaking through is expensive), and expertise (someone needs to do the editing, layout, cover design, etc.). And, as long as there is any print business at all, distribution still matters to a degree given the economics of writing a book: very high fixed costs with minimal marginal costs, which dictates as wide a reach as possible. Still, none of this explains why ebooks have been stopped in their tracks, and that’s where this discussion gets interesting: not only is it worth thinking about the ebook answer specifically, but also are there broader takeaways that explain what the theory got wrong, and how it can be made better? When the world’s largest publishers struck ebook distribution deals with Amazon.com Inc. over the past several months, they seemed to get what they wanted: the right to set the prices of their titles and avoid the steep discounts the online retail giant often applies. But in the early going, that strategy doesn’t appear to be paying off. Three big publishers that signed new pacts with Amazon— Lagardere SCA’s Hachette Book Group, News Corp’s HarperCollins Publishers and CBS Corp.’s Simon & Schuster—reported declining ebook revenue in their latest reporting periods. Pricing is certainly an art — go too low and you leave money on the table, go too high and you lose too many customers — and there is obviously a case to be made (and Amazon has made it) that in the case of books there is significant elasticity (i.e. price has a significant impact on purchase decisions). Then again, while ebook sales have fallen, they’ve stayed the same percentage of overall book sales — about 20% — which potentially means that the price change didn’t really have an effect at all (more on this in a bit). What is more interesting about the pricing issue, though, is that the publishers have removed what is traditionally one of digital’s advantages: that it is cheaper. That means the chief advantage of ebooks is that they are more convenient to acquire and store, and that’s about it. And, by extension, that raises the question of just how much lower prices play a role in the success of other aggregators. User Experience: Note what is lacking when it comes to ebook’s advantages: the user experience. True, some people certainly prefer an e-reader (or their phone or tablet), but a physical book has its advantages as well: relative indestructibility, and little regret if it is destroyed or lost; tangibility, both in regards to feel and in the ability to notate; the ability to share or borrow; and, of course, the fact a book is an escape from the screens we look at nearly constantly. At the very best the user experience comparison (excluding the convenience factor) is a push; I’d argue it tilts towards physical books. This is in marked contrast to many of the other industries mentioned above. When it comes to media, choosing a show on demand or an individual song is vastly preferable to a programming guide or a CD. Similarly, Uber is better than a taxi in nearly every way, particularly when it comes to payments; Airbnb offers far more selection and rooms that simply aren’t possible through hotel chains; Amazon has superior selection and superior prices, with delivery to your doorstep to boot. It’s arguable the user experience is undervalued in my Aggregation Theory analysis. Modularization: Notice, though, that there is something in common to all of my user experience examples: what matters is not only that the aggregators are digital, but also that they broke up the incumbent offering to its atomic unit. Netflix offered shows, not channels; first iTunes then Spotify offered songs, not albums; Uber offered the ability to call individual cars on-demand; Airbnb offered rooms, not hotels; Amazon offers every product, not just the ones that will fit in a bricks-and-mortar retail store. Ebooks, on the other hand, well, they’re pretty much the same thing as physical books, except they need an expensive device to read them on, while books have their own built-in screen that is both disposable and of a superior resolution (no back-lighting though). My ultimate takeaway — and this is very much subject to revision, as a static theory is a worthless one — is that that final point, modularization, is critical. 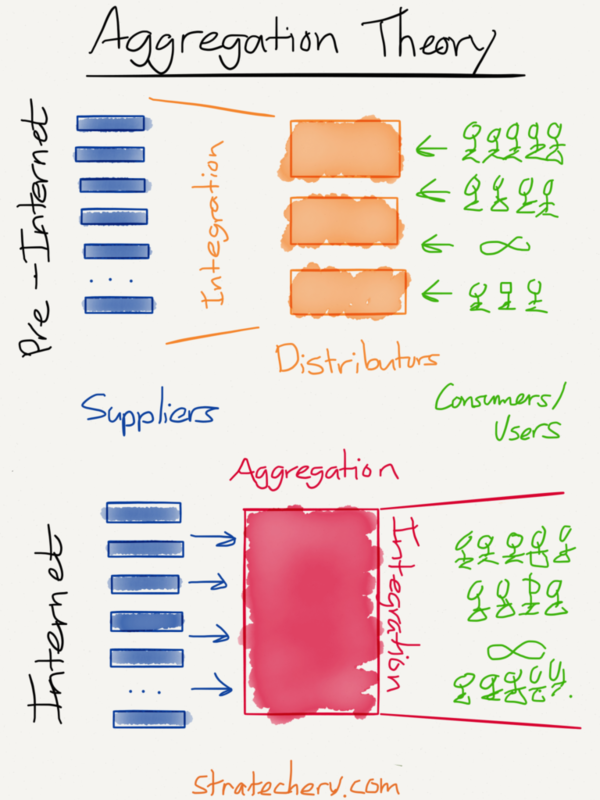 For Aggregation Theory to fully transform an industry it is not only necessary that some core aspect of the incumbents’ offering be digitized, but also that it be modularized into something that is cheaper and lends itself to a better user experience. Ebooks are digital but beyond that they’re not much different than books, and so, at least for now, the industry is a lot less different than many of us expected. There is one more point though: books don’t exist in a vacuum. The implication of ebook sales falling while remaining 20% of the industry is that the industry itself is in decline. Ultimately, in the grand competition that is the market for consumer attention, the fact that books aren’t really improving while everything else is getting better means the publishers may in the end be celebrating the most pyrrhic of victories.